Moving office? County Removals Ltd is capable of handling any size of business move and office relocation. We have extensive experience of moving both large and small commercial and private sector clients from County Councils to Hospitals to Solicitors to Engineers. Our team are also experienced in commissioning brand new installations, configuring many forms of new system furniture, retail branch refurbishments and closures. The planning stage is of critical importance – at County Removals Ltd we have specialists on hand, who get involved from the start and stay in continuous contact during the business relocation AND post-move. For larger Business moves we recommend several planning meetings where you will be introduced to senior members of the manual staff who will carry out your relocation. Our aim is to provide a total, bespoke relocation package, tailored to your exact needs. Specially dedicated packages for libraries, laboratories etc. 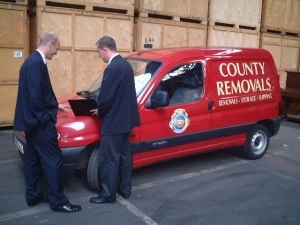 County Removals Ltd has a large pool of labour and a wealth of experience from which to draw – this is offered to customers on a full time or temporary basis. Our staff are flexible and hard working. Staff can be based at your business premises or from our depots and will work under our foremen or your designated personnel. All staff come fully uniformed, though you can provide them with your own uniforms if you prefer. Staff rotas can be arranged to suit any of your requirements including weekends, night shifts and public holidays. Our operations centre enables you to change your requirements, within your pre-agreed schedule, without financial penalty.